Cars Land at night is a magical place, but also challenging to shoot. The huge contrast between the bright and multi-colored neon and the darker sky and rockwork makes for both difficult white balance and proper exposure, at least in one shot. But shooting in RAW format does help a lot, especially with my full-frame Nikon D600, which records a lot of information onto the digital file. In the processing below, a lot of suppression of highlights has been plugged in, along with an increase in shadows to bring out the darker spots, and some digital selective neutral density filtering to alter the exposure across a gradient to more evenly balance the light levels in the composition. 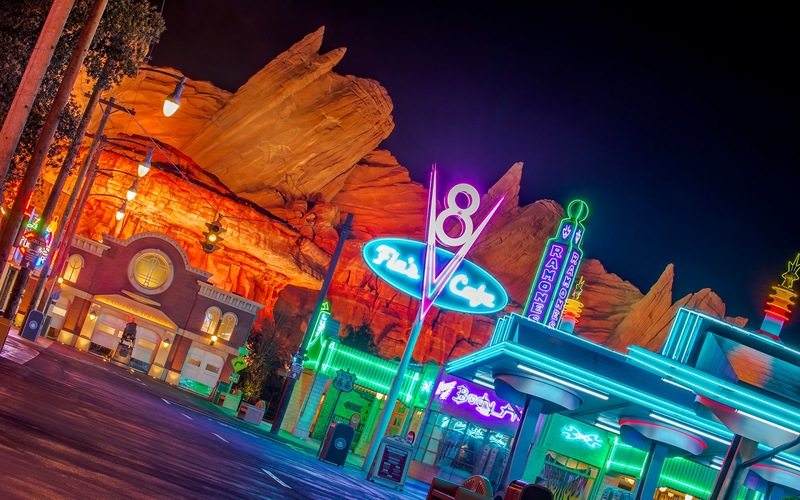 An angled view down the main drag at Radiator Springs.